NEW YORK (November 10, 2017) – Singles’ Day, held on November 11, is China’s most popular and the world’s biggest shopping event in terms of gross merchandise volume, surpassing all brick-and-mortar promotions. 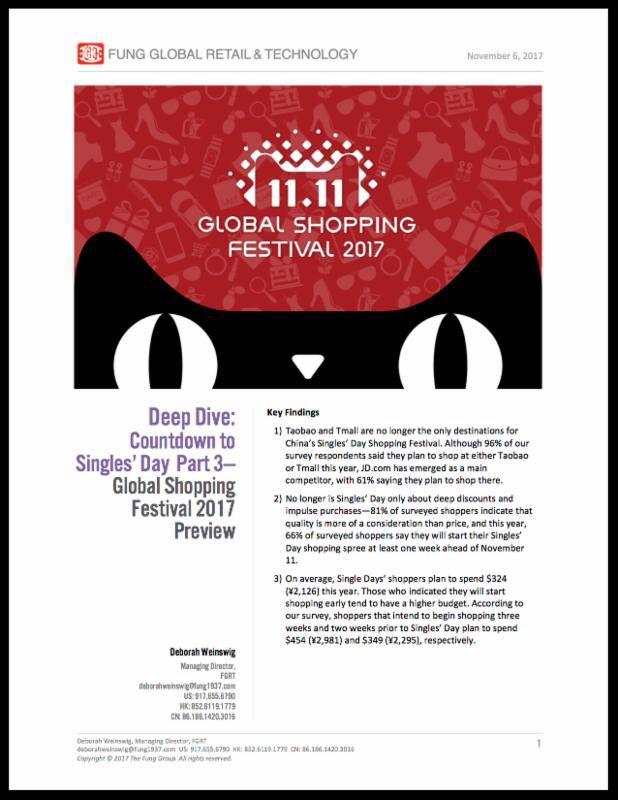 Despite logistical challenges experienced in 2016, this year’s event will continue to grow and evolve as consumers begin shopping earlier and focus more on quality than on deep discounts, says “Deep Dive: Countdown to Singles’ Day Part 3-Global Shopping Festival 2017 Preview,”a new report based on an exclusive survey by global think tank FGRT (Fung Global Retail & Technology). The report is based on data collected via FGRT’s online survey of 976 Mainland Chinese internet users between the ages of 18 and 59. Respondents self-completed the survey between October 10 through October 14. Now the biggest shopping event of the year with $17.8 billion in sales reported in 2016, the Singles’ Day festival has expanded beyond November 11, with many shoppers starting their sprees a week or more in advance. Some 93 percent of Chinese online shoppers participated in the event last year. In fact, the FGRT report notes that it is common for Singles’ Day shoppers to delay some or all of their planned purchases until the festival begins. But shoppers’ attitudes are changing, and they are increasingly focusing on quality rather than discounts. In addition, they are becoming more impatient about logistics problems. “Singles’ Day is renowned for the deep discounts offered by retailers, but online shoppers are no longer focusing on price alone,” writes FGRT Managing Director Deborah Weinswig. Some 78 percent of survey respondents indicated that they were more focused on quality than on price when shopping during Singles’ Day last year, and more than half said they believe they will have to request a refund or exchange goods purchased this year. Nearly one in three respondents reported canceling an order last year because of delays. “Logistics remains a key issue among survey respondents, and, if not tackled properly, could lead to a drop in sales this year-32 percent of surveyed shoppers say they have cancelled all or part of past orders due to long waiting times,” Weinswig continues. Other shifts are taking place. While Alibaba’sTaobao and Tmall remain the dominant sites for Singles’ Day shopping, with 96 percent of surveyed shoppers saying they will patronize the sites, JD.com has emerged as a serious rival, with 61 percent of shoppers planning to shop the site on Singles’ Day. Two other sites – Vipshop and Amazon China – are lagging behind, with only around 15 percent of surveyed shoppers planning to shop there. FGRT’s reports can be found at www.FGRT.com and www.deborahweinswig.com. Subscribehere to receive Deborah Weinswig’s daily news and analysis on retail, fashion and technology. FGRT (Fung Global Retail & Technology) is a think tank whose research team, based in New York, London and Hong Kong, follows emerging retail and tech trends, specializing in the ways retail and technology intersect, and in building collaborative communities. 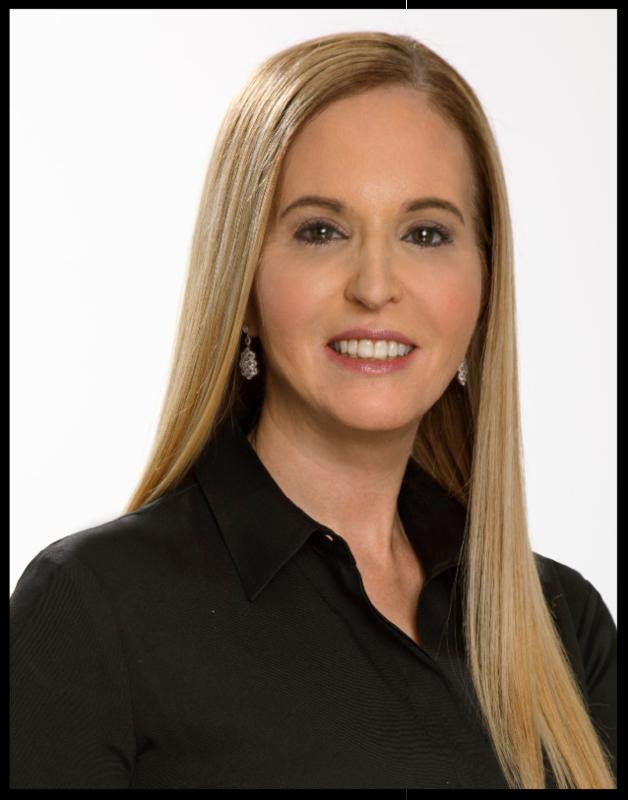 The team, led by Deborah Weinswig, former top Wall Street and retail tech analyst and startup advisor, publishes ongoing thematic and global market research on topics such as the Internet of Things, digital payments, omnichannel retail, luxury and fashion trends, and disruptive technologies. More information can be found at www.fgrt.com. © 2019 Deborah Weinswig. All rights reserved.